Now you can make fabulous three-dimensional stained glass sculptures like the ones on this website. Order this book and you will be making them too. The how to book costs only $12.95 + $3.00 to cover shipping and handling in the USA. Book cover and back is in color. Book has 52 pages in it. Inside of the book is all in black and white. Print is big and clear. Approximately 10 pages of black and white pictures. Approximately 32 pages of diagrams. Approximately 10 pages of instructions and information. 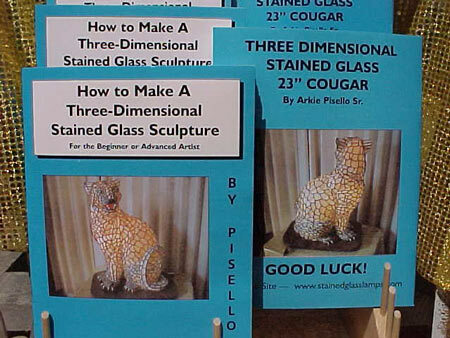 It gives good, clear instructions to help you finish your sculpture. All this for only $12.95 + $3.00 for shipping and handling!! Don't delay, get your "How to Make a Three Dimensional Stained Glass Sculpture" - Call today! If you have any questions or problems after ordering the How To Book feel free to contact us via phone .